SnapView is a tool that will turn your videos into circular format so they look like been shot using Snapchat Spectacles. There’s been plenty of excitement around Snapchat over the last few years, and more so in the last part of this year as the company has not only added a ton of new features to its mobile apps, but also positions itself under the Snap Inc. brand to become a more hardware-focused company going forward. Part of that pivot has involved the limited release of the Spectacles hardware, designed to capture video from the wearer’s perspective and then be uploaded against a Snapchat account. If you have thus far been unsuccessful in getting your hands on a pair of Spectacles, but still want to share the same type of experience (circular videos), then the quickly cobbled together SnapView web experience may be of interest to you. 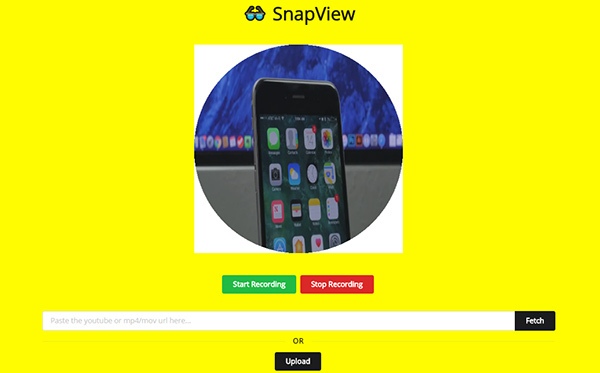 SnapView is essentially a very rudimentary Heroku hosted web app that looks to take an existing video and make it appear as if it has been recorded using Snap Inc.’s Spectacles hardware. Rather than be taken as a serous project, the whole SnapView experience has come to life purely as a retort to a tweet posted out by the official Product Hunt Twitter account requesting that someone takes the initiative to build a tool that crops regular videos into a circle format with a white background, with the promise of a free shirt and “infinite shoutouts.” SnapView is that infinite shoutout tool. The app itself is extremely simple to use and should be workable by users with even the lowest level of technical knowledge. Users are simply invited to either upload a video file directly to the tool, or paste in the URL or YouTube link in the provided text field. The SnapView tool will then fetch the video and go through the process of cropping it and rendering it into the expected round Spectacles format. There’s also an option for users to start recording audio directly from their machine so that the video and audio can be spliced together. The result of that experience is SnapView spitting out two video files; one purely of the video in a webm format, and one with audio embedded that can be used to share on many social networks. The only real issue with the experience is that there may be a little bit of conversion required into different video formats for those that physically want to share both video types, but that’s a very small price to pay to get this Spectacles experience without actually owning the hardware. Head over to snapview.herokuapp.com to get started with the experience right now.